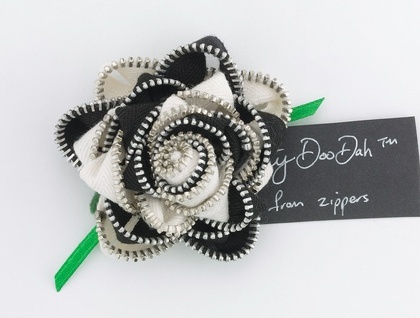 This striped rose is made from vintage zips. Vintage zip tapes are soft and have fine metal teeth that add a jewel like sparkle to the rose petals,They have a safety pin on the reverse side so you can pin them to your favourite outfits/hat /bag/coat. Please note this listing is for one rose, please specify the colour you would like when sending through delivery details.